From "The Abbot and the Black Knight." Used by permission, L. Tom Perry Special Collections, Harold B. Lee Library, Brigham Young University. Introductory Note: In this story, a narrator relates folktales associated with a small, isolated chapel in Brittany (a region along the northwestern coast of France). These tales include the misdeeds of a vicious Bluebeard and the temptations of a prideful Catholic priest. In this telling, the stories function both as Gothic adventure fiction and as cautionary tales depicting the dangers of pride. On the Auray road, a few miles from Vannes, the poorest and most miserable prefecture in France, the traveller may observe a chapel built, no one can exactly say when, upon the site and from the fragments of the ruins of an ancient church, which was no doubt destroyed during some of the civil wars to which Brittany has been so frequently the prey. This chapel is dedicated to the Magdalen, and served for a long time as the hermitage of a converted Jew, who here closed his life in the odour of sanctity. Its last tenant was an aged hermit, who held before the Great Revolution a high rank in the French army, and who here sought an asylum from the cares and annoyances of the busy world, and here hoped to find consolation for the treachery of an early loved one on whom he had doted; and here in silence and prayer he passed the few remaining days still left him.1In this case, the Great Revolution would be the French Revolution, 1789-99. These, however, are only the more recent associations connected with the place: those of a remoter period are much more romantic and poetical. On this spot was accomplished the unhappy fate of Trifine, the only daughter of Count Guerech of Vannes, about the commencement of the sixth century. 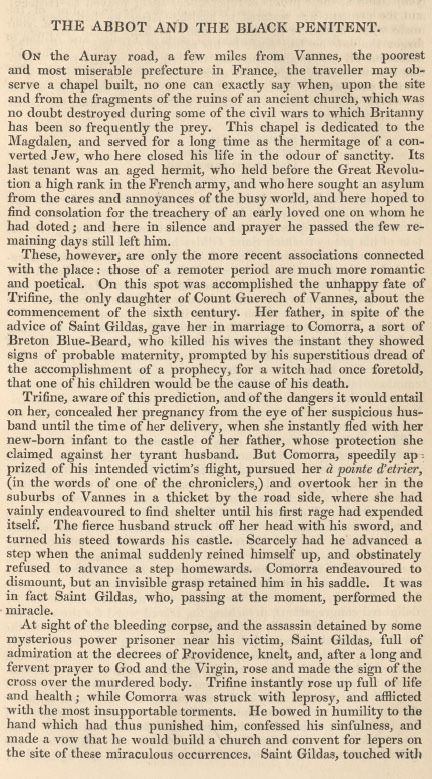 Her father, in spite of the advice of Saint Gildas gave her in marriage to Comorra, a sort of Breton Blue-Beard, who killed his wives the instant they showed signs of probable maternity, prompted by his superstitious dread of the accomplishment of a prophecy, for a witch had once foretold, that one of his children would be the cause of his death. Trifine, aware of this prediction, and of the dangers it would entail on her, concealed her pregnancy from the eye of her suspicious husband until the time of her delivery, when she instantly fled with her new-born infant to the castle of her father, whose protection she claimed against her tyrant husband. But Comorra, speedily apprized of his intended victim’s flight, pursued her à pointe d’etrier, (in the words of one of the chroniclers,) and overtook her in the suburbs of Vannes in a thicket by the road side, where she had vainly endeavored to find shelter until his first rage had expended itself. The fierce husband struck off her head with his sword, and turned his steed towards his castle. Scarcely had he advanced a step when the animal suddenly reined himself up, and obstinately refused to advance a step homewards. Comorra endeavored to dismount, but an invisible grasp retained him in his saddle. It was in fact Saint Gildas, who, passing at the moment, performed the miracle. Although the Devil had thus lost one whom he considered a safe customer, still in no way did it discourage him; but, on the contrary, it rendered him only the more determined to seek his revenge for his loss of his prey of which Saint Gildas had, in his opinion, unwarrantably defrauded him. One of his attempts in that way is recorded in the following story, which the writer himself heard told one evening last year within the ruins of Magdalen. Unluckily for the reader, he cannot bestow upon the narration all the accompanying charms which hearing it upon the spot conferred—the time, the place, the poetical language of the narrator, (a young girl of Brittany,) and the deep conviction she seemed to have of the truth of the story which she told, picturesquely supporting her hand on the fragments of a broken cross, her voice full of deep emotion, increased by a feeling of superstitious terror, in which many of the hearers could not avoid participating,—all contributed to render the story one of those which, once heard, are never forgotten. The artist had carved in the dark wall which composed the confessional the woman’s triumph over the serpent; at the upper part he had depicted the Madonna, full of that serenity which painters so love to give her, her eyes raised to heaven, her hands joined in the attitude of prayer, and her foot firmly fixed upon the forehead of a gigantic devil, already prostrate, and whose limbs trembled with terror. The priest gazed for some time in complacency on his confessional, and then felt a natural desire to ascertain if its interior corresponded in beauty and taste with the outside. Impatient to prove the elasticity of the cushions of that seat which he was in future to occupy, he placed the lantern amidst one of the groups of sculpture which ornamented the pilasters, and flung himself on the sacerdotal seat, into the soft cushion of which he sunk not without voluptuousness. He rested his head carelessly on the rich velvet hangings, stretched out his feet upon the stool studded with golden nails, and found himself altogether so comfortable, that he speedily forgot his fatigue, and surrendered himself to “thick-coming fancies.” He first thought of the crowds who were sure to come to each side of the confessional to humble themselves before him; the priests of the church, the wealthy citizens, the haughtiest seigneurs even,—all with humble voice and repentant lips supplicating his advice, and regulating their conduct by his directions. While thus indulging his imagination, he suddenly heard a voice on one side, which announced that the speaker sought his ghostly assistance. He mechanically withdrew the bolt which fastened the side-window; at the same instant a most violent clap of thunder was heard; the lightning illuminated the whole church, while a strong smell of sulphur nearly took away his breath. When he re-opened his eyes, which terror had closed for a moment, he beheld a stranger kneeling beside him in the confessional. “You!” responded the priest, in utter astonishment. He extended his hand, and the column which supported the lamp was instantly converted into the purest gold, and the flags of the tower were sprinkled with diamonds. While he spoke a vaporous light, like the softened effulgence of the full moon, played over the brow of the unknown. The aged priest, spell-bound, and full of alarm, gazed with surprise on the noble and commanding features they indicated. The priest raised his hands in amazement, and in doing so the blessed cross, which he was holding, fell to the ground, and rolled along the nave. Whereever it touched as it rolled along, the diamonds created by the magic power of the stranger disappeared, and resumed their first and true appearance of dust. While he spoke he stretched forth his hand towards the priest, who at the moment felt an inexplicable change take place within him. He rushed forth from his confessional. Wonder of wonders! the figure which cast its shadow on the walls was no longer that of an aged man, but of an elegant and youthful cavalier! He felt the warmth and strength of youth flowing through his veins; the few scattered locks which has whitened his brow were changed into black and perfumed curls; his small white hand showed a delicate formation, such as a young maiden would be but too proud to possess. He walked a few steps, and at each movement, at his least wish, the most extravagant desires of his imagination were instantly realized. He wished for power, riches, pleasure; pages, valets, and knights knelt at his feet to receive his commands! Beautiful virgins, in luxurious attire, smiled upon him in languishing beauty; palaces sprung up in the midst of extensive gardens; and he wandered amidst these glorious objects, young, smiling, and eager, his heart beating with new emotions and desires. Suddenly the unknown of the confessional appeared. The priest shudderingly turned away his head. “Go, then, weak and cowardly mortal; become again what thou wast; poor, old, and in the jaws of death!” cried the tempter. The priest now felt the blood which ran a moment before impetuously in his veins curdle, and slowly circulate; he beheld his hands grow stiff, and all the brilliant objects which surrounded him become more and more distant—fast disappearing. You may imagine the terror and joy of the old priest at his escape, as well as his gratitude to the divine protection to which he owed his salvation. He prostrated himself in the confessional, and did not cease pouring forth oremuses until day broke in upon it, and shewed him on the spot where the demon had knelt, two marks burnt into the stone by the knees of the evil one. Tradition adds, that the rector had the soft and voluptuous cushions, on which he had reposed the night of his temptation, replaced by a plain seat, studded with sharp-pointed nails, on which he sat to hear the confession of his penitents; and that he died, in the fulness of grace, three years after the consecration of his church. Towards the close of the fifteenth century there was still exhibited in this chapel the penitential seat used by St. Kernoeck; but the precious relic unluckily disappeared amidst the civil wars which about that time raged in Brittany. It is not supposed that the sacrilegious thief who stole it, whoever he was, ever sat upon it himself. "The Abbot and the Black Penitent." Bentley's Miscellany, vol. 4, no. 21, 1838, pp. 261-5. Edited by Scott Lee. Victorian Short Fiction Project, 25 April 2019, http://vsfp.byu.edu/index.php/title/the-abbot-and-the-black-penitent/. 1. ↑ In this case, the Great Revolution would be the French Revolution, 1789-99.